What do Apple, Twitter, Facebook and Google plan for the travel industry? 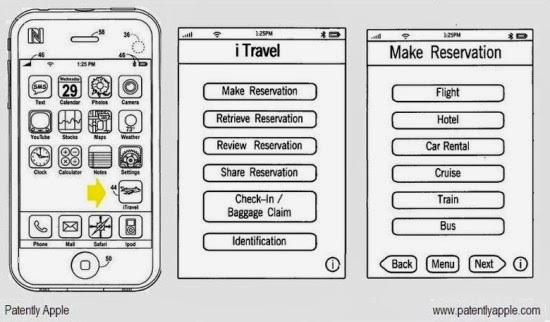 Back in 2010, travel industry commentators went into overdrive as it was announced that Apple had patented ‘iTravel’. According to the Patently Apple blog, iTravel is designed to facilitate ticketless travel as well as check-in services with a plan to employ near field communication (NFC) for identification and ticketing by transportation providers for iPhone. Was this going to be Apple’s first foray into the travel space? The industry got pretty excited, after all a mega brand like Apple could carry serious weight in the travel space and have a profound influence on the travel lifecycle. Since this date though, aside from the launch of Passbook in 2012, they have remained fairly quiet on the travel front. Last year however, Apple launched their own NFC technology, iBeacon. In November they updated their patent for iWallet. Combining all these technologies would result in a pretty useful offering to travelers on the go. This year, I couldn’t help but notice that for the first time employees from Apple will be attending EyeforTravel’s upcoming Social Media & Mobile Strategies for Travel conference in San Francisco next week. I’m going to be sure to ask them what insights they might be able to provide into what lies in store. Industry giants Twitter, Facebook and Google will also be at the event. Each of whom have the ability to be a disruptive force in the travel industry, particularly with their access to enormous datasets and daily interactions with consumers. What do they all plan? Stay tuned on this blog next week to find out what’s discussed! You can also follow the event discussions using the twitter hashtag #smtravel14 or to be at the event in person contact me – gina@eyefortravel.com.